Felsted is a typical Essex village near to the county town of Chelmsford. It was the country area in the early 20th century where my maternal great grand mother Lucy Jarvis and her extended family lived and worked as part of the enormous agricultural industry. My grandmother, Winifred Jarvis, was born in 1902 into a large family who lived on Woods Farm, Bannister Green, Felsted, where her father Arthur was the farm bailiff. Arthur had a cousin Robert Jarvis, who was a horseman, and lived at Pond Gate Cottages, Felsted with his sons Albert - born in 1892, and Frank - born in 1896. At the outbreak of the war in August 1914 Frank was working in domestic service and unlike his brother Albert, he had not joined the territorials. so had not been called up in 1914/15. Unfortunately, Frank’s army service records have not survived so that I have had to rely on other sources of information to construct a picture of his WW1 experiences. 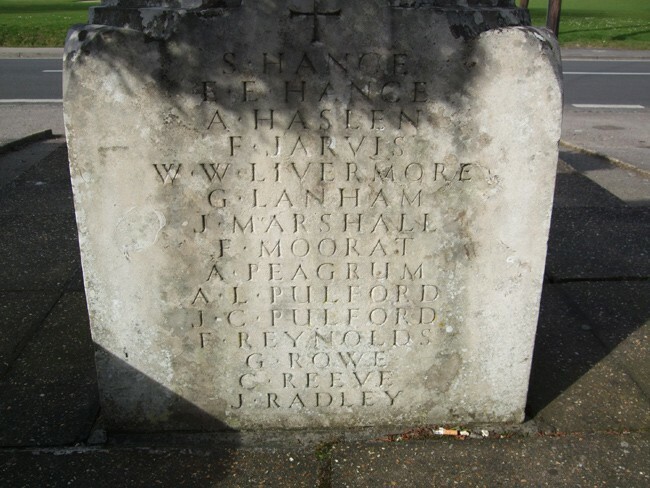 His name appears on the Felsted War memorial (Figure 1) so I knew that he had died in the war. My starting point was to look at the Soldiers Died in the Great War database. This told me that he enlisted at Braintree, Essex and at the time of his death in October 1918 he was serving with the Border Regiment. Finding his Medal Index card showed that he was initially in the Essex regiment before transferring to the Borderers. According to Ian Hook of the Essex Regiment Museum, Frank was put into the 3/6 Battalion, Essex Regiment, a training unit, and was sent overseas to a depot in France before being transferred to the 3/5 Border Regiment no 5598. 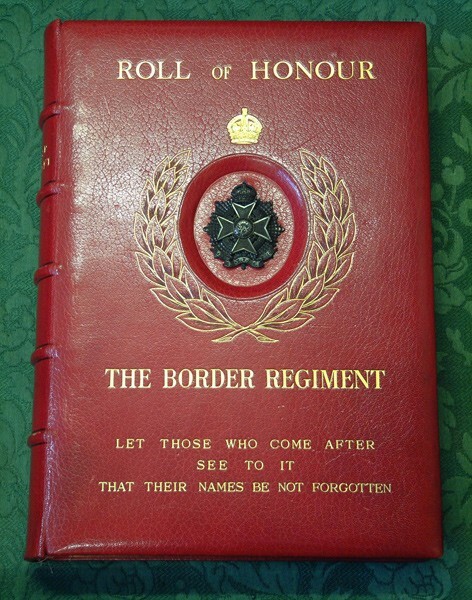 This was confirmed from the Medal Roll of the Border Regiment at Kew (Figure 2) and by Stuart Eastwood the curator of the Border Regiment museum in Carlisle. His database showed that 175 men were transferred from the Essex to the Border Regiment in the late summer of 1916. To find out more about this I sought the assistance of Chris Baker’s Fourteen-eighteen research. This confirmed the above but also added that Frank Jarvis might have volunteered under the Derby Scheme between January and March 1916 or have been conscripted on 2 March 1916 and mobilized on 27th March 1916. Being in the 3/6 Essex Training Battalion he would have done his basic training at Halton Park in Buckinghamshire before being posted with a draft of other Essex men to France on 29 August 1916. However, before embarking for France they appear to have been transferred to the 3/5 Battalion Borderers another home based training unit. The army bureaucracy was such that as a territorial the only way to be transferred from one regiment to another was firstly to be transferred to another territorial unit. 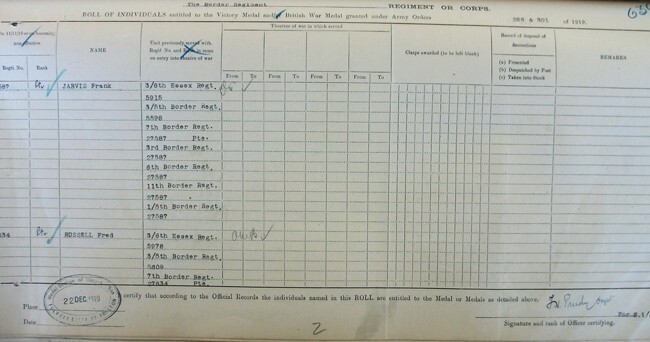 What is unusual about Frank Jarvis is that these paper transfer exercises are recorded on the Border Regiment Medal Roll so that we have the total picture of his army career. Frank and the 175 other Essex men moved from the base depot to the 7th Battalion Borderers on 25 September 1916 and he became Private 27587. On 2 November, the Battalion attacked the German Zenith trench which was a complete success in the moon light with few casualties. The Battalion was relieved and went back to Montauban village, where it received the commendation of the Commander in Chief, Field Marshall Haig. December 1916 was spent in training and Brigade reserve at Guillemont - including Christmas festivities. The War diary gives no description of how they celebrated Christmas or what they ate but although it must have been very different to a family Christmas in Felsted. I am certain that much was done to help the men forget the war for just one day. The organizational structure of the British Expeditionary Force was based upon sections, platoons, companies, battalions, divisions, corps and armies. The men mostly associated themselves with their Regimental Battalion, the core unit of the fighting machine which was constantly being revised through wartime experiences. Haig, as C in C, had to manage and manipulate his forces up and down a front line that, as the war progressed, got longer and longer as the B E F took over more ground from the French. Thus it was in the Spring of 1917 that the 17th Division was moved about like a pawn in a giant game of military chess. In March 1917 it began in XIVth Corps of 4th Army, then got moved to IInd Corps of 5th Army before going to XIXth Corps of 3rd Army. 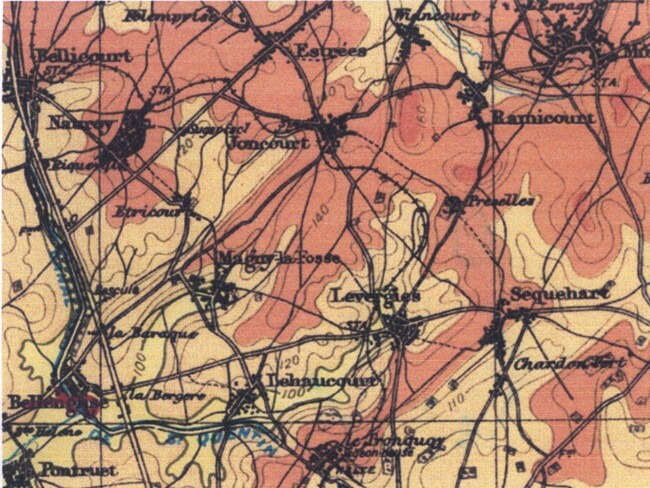 At this time the 3rd Army was around Gezaincourt, Southwest of Doullens, training for the Battle of Arras. The Battle of Arras is not as well known as the Somme or Third Ypres. Yet, in 39 days from 9th April to 17th May, it became the most bitter contest for the infantry Battalions. The result was 159,000 casualties - a daily rate of 4076 - compared with 2923 on the Somme and 2323 at Passchendaele. Arras was only a diversionary battle, agreed reluctantly by Haig to take the enemy’s attention away from a planned French assault in the Champagne. Had Arras only lasted until 14th April it would have been extremely successful with a relatively low casualty rate. However, Haig was forced to carry on into May 1917 with greater casualty rates and long term consequences for the 7th Borderers and Frank Jarvis personally. 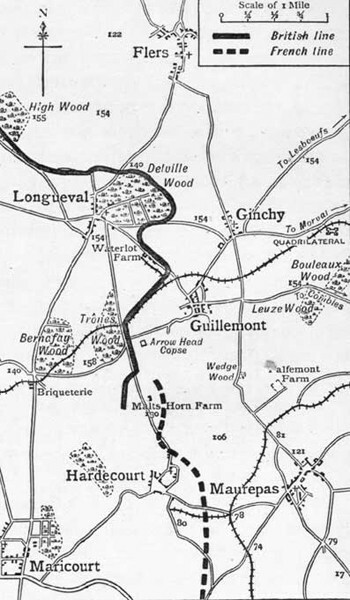 On 11th April 51st Brigade, that had been in the Divisional reserve, moved to Railway Triangle (Figure 4) north of the village of Monchy-le-Preux and occupied dugouts in the railway embankment. 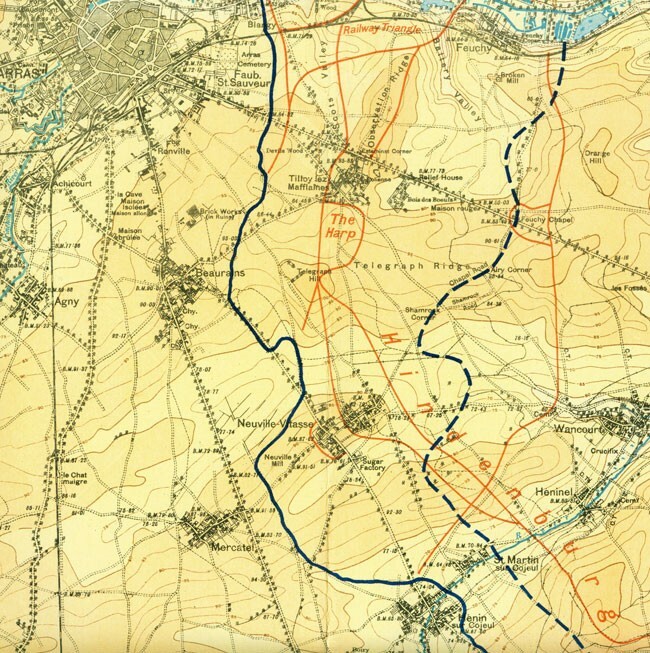 The 7th Battalion war diary provides a detailed explanation of the attack and its objectives. 7th Borderers were attacking Bayonet trench but did not get far as they came under intense machine gun fire from River Trench and from across the other side of the river Scarpe. The survivors had to withdraw back to the assembly trenches from where they had attacked. Many men were caught in shell holes and had to find their way back under cover of darkness. In the early hours of April 24th survivors of 7th Battalion were ordered back to the Railway Triangle. The Battalion had suffered heavily with 19 killed, 186 wounded and 214 missing. 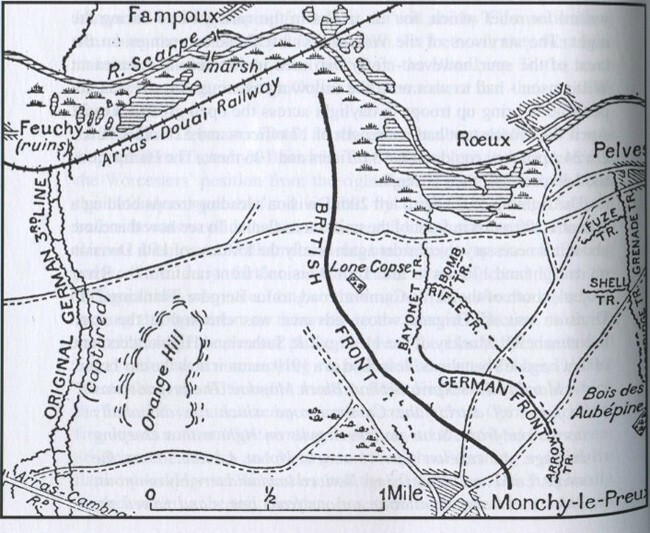 Jonathan Nicholls in his excellent book on the Battle of Arras ‘Cheerful Sacrifice’ describes how the 7th Borderers and South Staffords of 17th Division lead the assault up the slopes between the river Scarpe and Monchy-le-Preux. BUT the Border men, mainly miners, dalesmen and farmers from Kendal, Whitehaven and Cockermouth together with the Essex agricultural boys never got anywhere near to the enemy to use their bayonets. An eye-witness in the 7th Battalion recounts the 23rd April 1917, St George’s Day. None of Frank Jarvis’s Service records have survived so we do not know officially whether he was one of the many wounded on 23rd April. However his medal roll entry (Figure 2) shows that at some point he was in the 3rd (Reserve) Battalion Border Regiment that was a UK based training unit. This suggests that he had been wounded and been sent back to a UK hospital and then onto a Border regiment training unit that in 1917 was based at Great Crosby near Liverpool. According to the Long, Long Trail website, 57% of wounded men were sent back to the UK for treatment and convalescence. Obviously Frank Jarvis wounds were not serious enough to prevent him from travelling so he had what was known as a ‘Blighty one.’ Whilst the list of military hospitals is easily available, I can find no explanation as to how it was decided to where an individual wounded man was sent. As the casualty lists expanded so did the range of hospitals across the country. In addition, command depots were established to provide rehabilitation prior to a return to the regimental training depot. So Frank must have gone through the process of treatment, recovery, convalescence, rehabilitation and retraining into the 3rd (Reserve) Border Regiment. With no surviving service records, we have no precise date as to when Frank returned to the Front but we do know that he was sent back to join the 6th Battalion Borderers sometime in the summer of 1917. 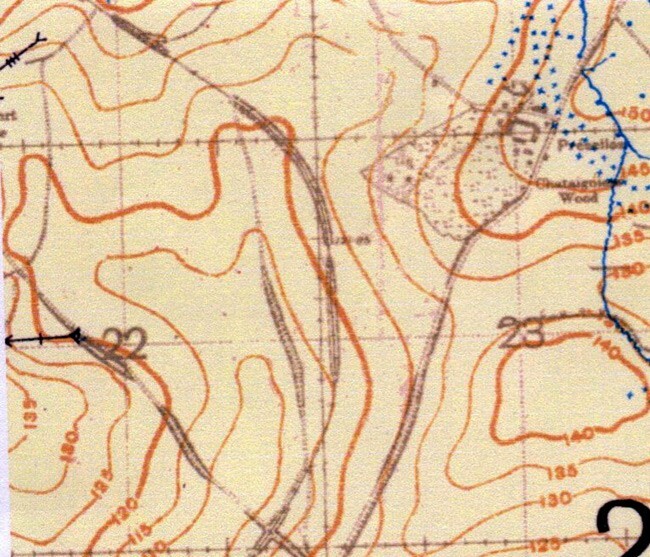 The 6th Border Regiment was in the 33rd Brigade, 11th (Northern) Division. This Division had been in Gallipoli before joining the latter part of the Battle of the Somme, and had just been involved in the Messines Ridge attack in the late summer of 1917. According to the War Diary WO95/1817 in August 1917 the 6th Battalion was at St. Julien, Ypres sector when it received 153 Other Ranks as reinforcement prior to its involvement in the Battle of Langemarck. Frank was likely to have been one of them. On 22nd August at 4.45 am the barrage commenced and after 42 minutes it moved forward followed by C and D companies of 6th Borderers. In spite of intense enemy machine gun and artillery fire they achieved their objective and consolidated it so that on the night of 24/25th August they were relieved by the South Staffords. There were more stints in the front line trenches until, on 29th August, they were taken out of the action having suffered 74 casualties. Frank was back where he had left off in April 1917 in the thick of a battle. The War diary tells us that September 1917 was spent in training around Houtkerque. Then on 4th October they returned to the front line as support to the 33rd Brigade, but were not actually used in any action. The remainder of 1917 saw many moves around the area ending with a spell in a hut camp at Nouex-les-Mines. 1918 dawned with the B E F defending a larger section of the front line and rumours of a big German offensive circulating. The high rate of attrition in the 1917 offensives had taken its toll and, as we now know, Lloyd George’s reluctance even refusal to release UK based reserves resulted in a reorganization of the Divisional composition of the B E F in France. The number of Battalions in each Brigade was reduced from four to three. Thus it was on 4th February 7 officers and 150 OR’s of C Company left the 6th Battalion to join the ranks of the 11th Battalion Border Regiment known as the Lonsdales, having been formed by the Earl of Lonsdale in 1914. Frank was one of these men as we can see from the very lengthy Medal Roll (Figure 2) He was now in his fifth different Battalion of the Border regiment since August 1916! The 11th Battalion was in the 97th Brigade of the 32nd Division and in February 1918 it was in Caribou Camp near to Elverdinghe, Ypres where they carried out a number of daring trench raids on the enemy prior to the German spring offensive. When the offensive commenced on 21st March 1918 the 11th Bn was hastily moved south to take up defensive positions around Moyenneville and Ayette. From their War Diary it appears that the 11th took little part in what became known to us as the first Battle of the Somme 1918, or the St Michael offensive to the Germans. This was effectively the end of the Lonsdales’ active fighting because on May 10th the 5th and 11th Battalions of the Border Regiment were amalgamated and the 11th part was despatched to Feuquieres to train the incoming ‘dough boys’ of the 328 US Infantry Division. This they did until on 31st July 1918 the 11th Battalion was officially disbanded and the men, including Frank Jarvis, transferred to the 1/5th Battalion, remaining in the 32nd Division. ‘10th August ------ 5th Bn Border regiment on the left the advance at first went smoothly. Against stiffening opposition the Borderers reached the 1916 British Front line at 10am. Ahead lay the ominous 1916 No Man’s land the site of one of history’s greatest slaughters’. On 5th September the forward momentum continued as the 97th Brigade crossed the River Somme at Brie. 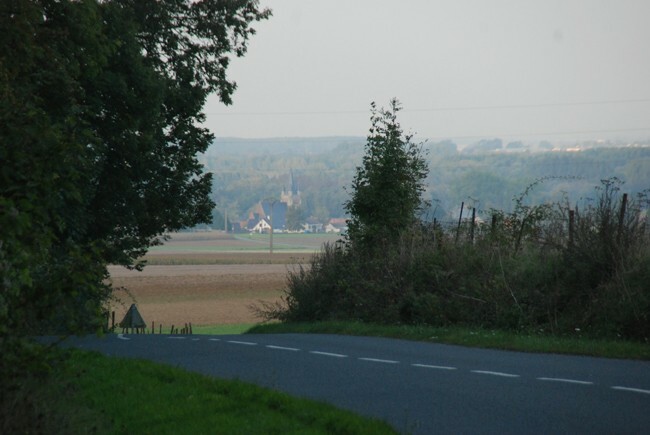 Nothing seemed able to stop the allies as they swept on so that by 6th September the 5th was on the Tertry--- Peronne Road. On 12th September the Battalion was relieved and went back to Villers-Bretonneux for a well-earned rest. The 5th Borders entered the village of Preselles but heavy machine gun fire forced them out and they had to withdraw to a Railway Embankment overlooked by enemy artillery from higher ground to the east. On October 2nd the Battalion’s position in this railway embankment was heavily shelled by the enemy, resulting in 1 killed and 17 wounded. (Figure 8) Sadly the one killed was Frank Jarvis, the valiant Essex farm boy who had survived over two years of fighting only to die six weeks before the end of the war. 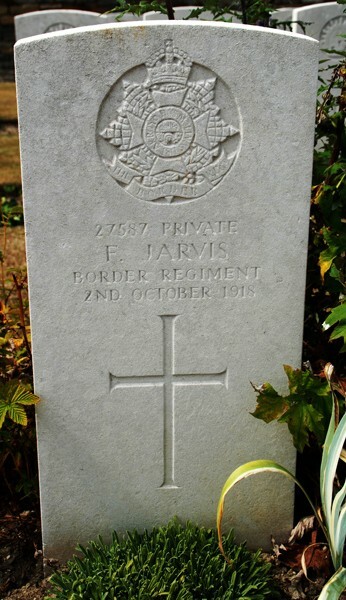 Frank Jarvis, Private 27587, is buried in Bellicourt British Cemetery (Figure 9) which was started after the battle in late 1918 and significantly enlarged after the armistice through the consolidation of many surrounding small cemeteries. It may be that Frank was initially buried in one of these. His parents must have been informed relatively quickly after October 2nd. His death was reported on November 8th in the Essex Chronicle and on November 15th in the Essex Weekly News Roll of Honour. Frank is not forgotten and as we move closer to the centenary of the Great War we can celebrate his short life and his bravery and courage . The Border Regiment In The Great War By H C Wylly, Gale & Polden, pages 97, 98, 103, 129 To 132, 15, 152, 173, 174, 179 To 181, 195 To 197 and 218 To 221.